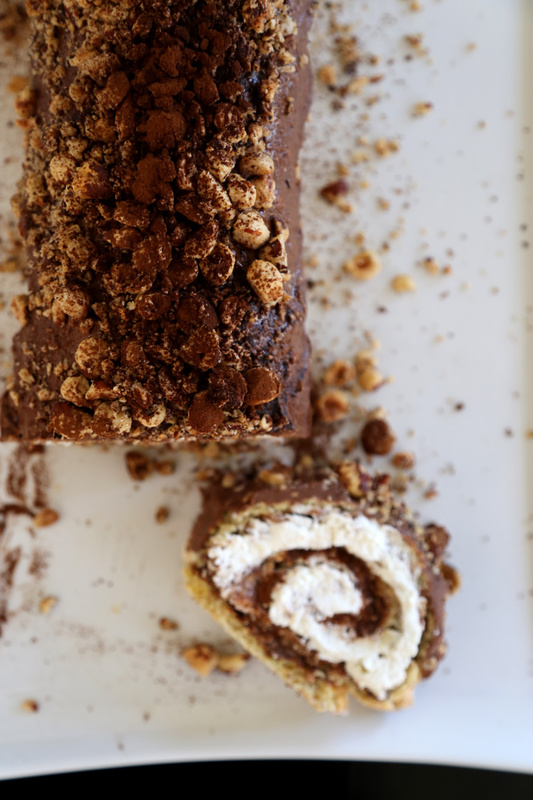 Chocolate Hazelnut Cake Roll + a Giveaway! 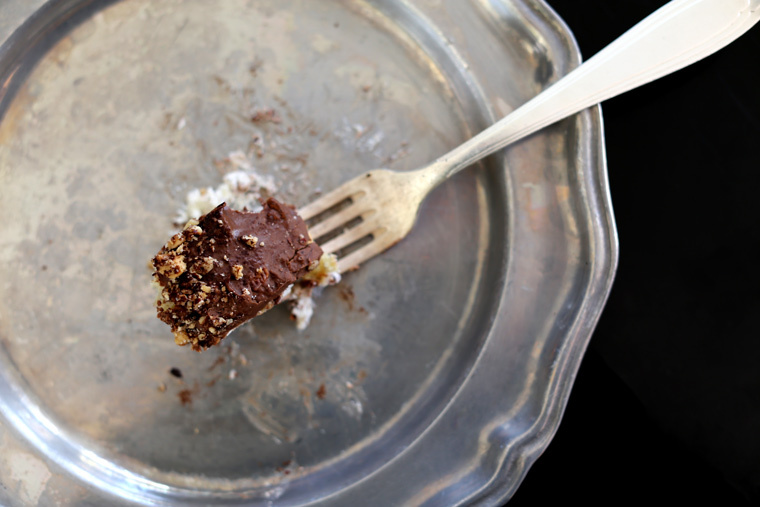 In your food processor: mix the nuts, salt, oil, powdered sugar, vanilla and cocoa powder together to form a paste. Then add the melted chocolate and blend until smooth. 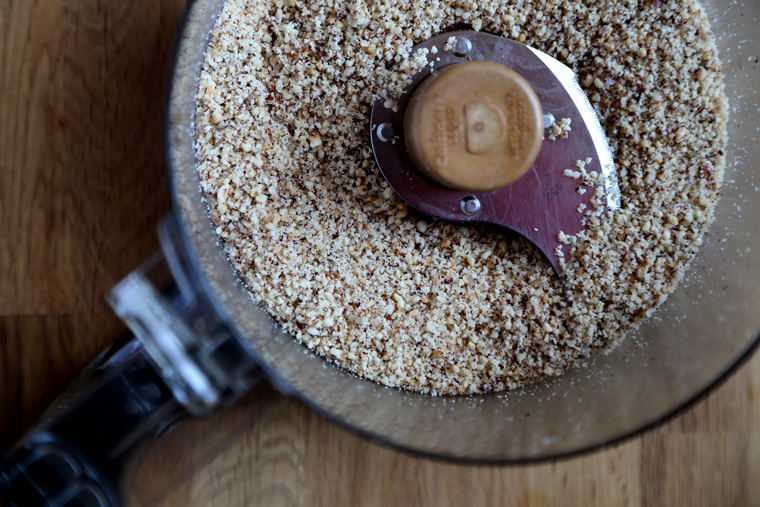 Make hazelnut flour in your food processor. 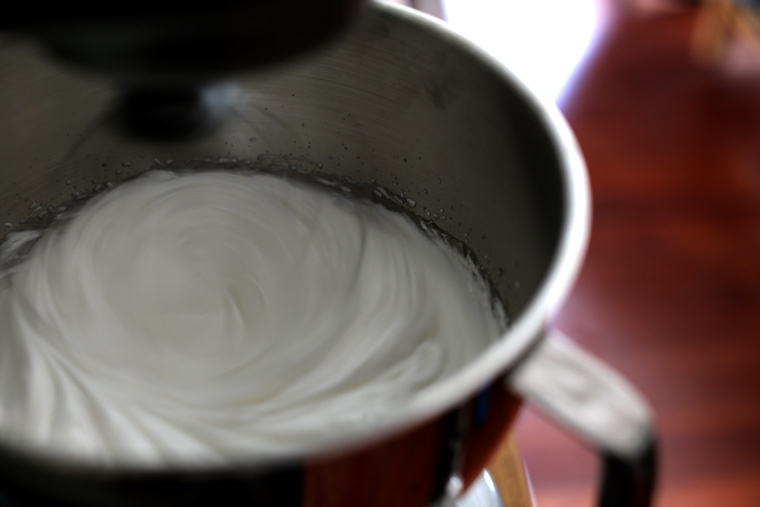 Whip the egg whites to form peaks. Slowly add the sugar to make a meringue. Dust the flours on top of the egg white peaks. Add the egg yolk and then gently fold ingredients under. 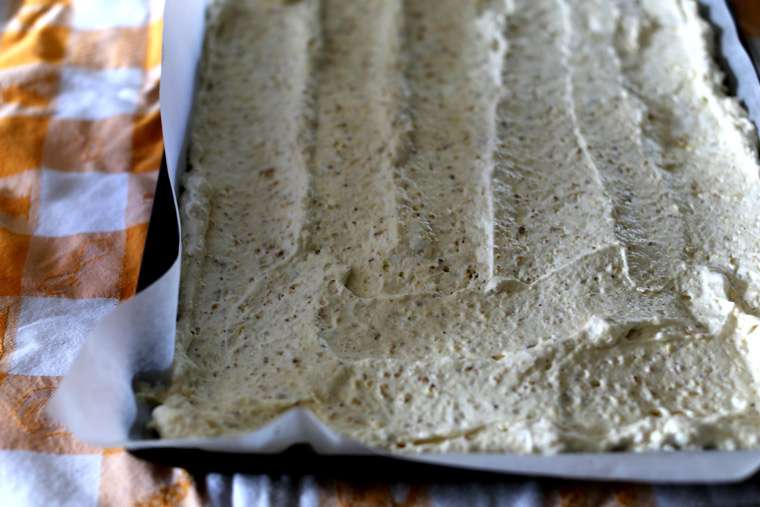 Spread ingredients on parchment paper covered cookie sheet. Place in preheated, 345° oven between middle and top rack. Bake for 10 to 15 minutes. 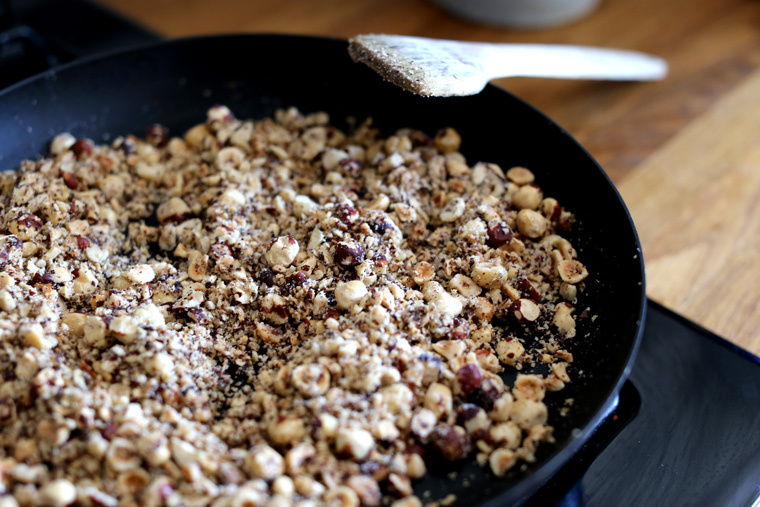 While the pastry bakes, make the hazelnut crocante – toast chopped nuts on medium heat with a tablespoon of butter. When the nuts are toasted and fragrant, turn heat off and add a tablespoon of sugar. Roll it up with the towel and let it cool. After the cake has cooled. Smear on the nutella. 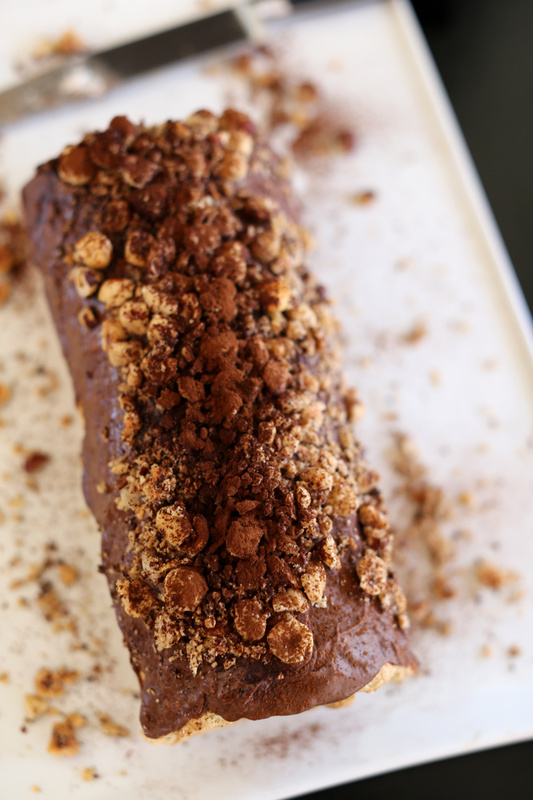 Top with hazelnut crocante, dust with cocoa powder. Top with whip cream. 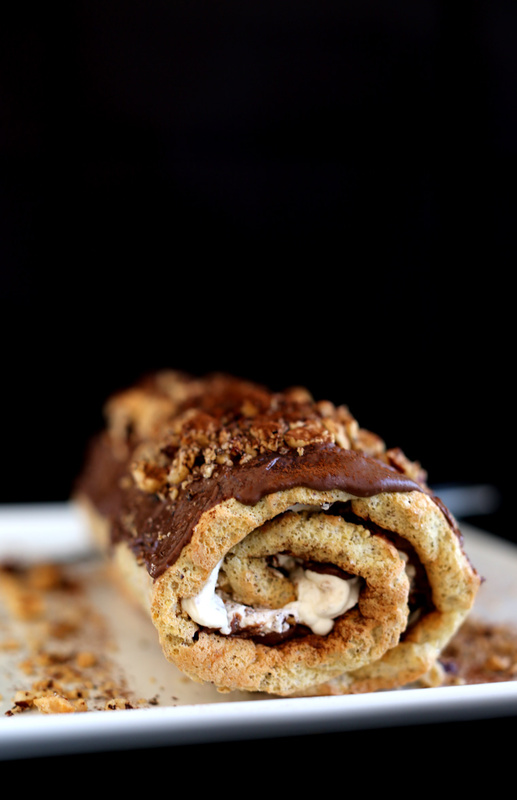 Top roll with nutella and hazelnut crocante. 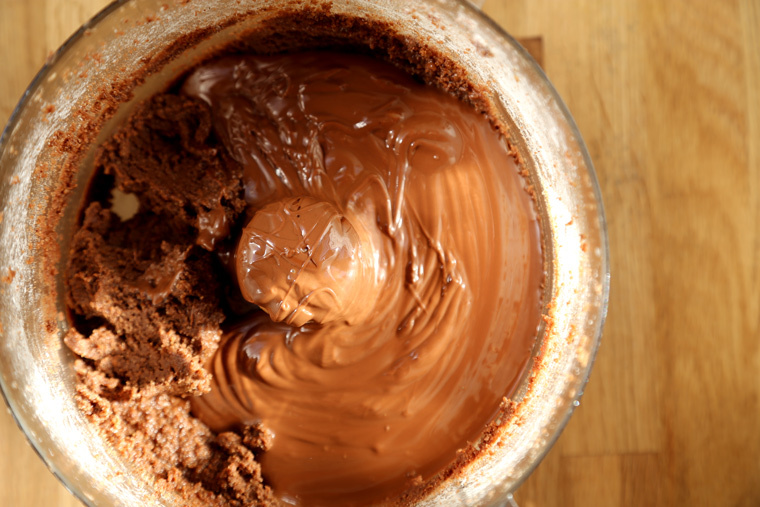 To make the nutella, melt the chocolate on low heat in a double boiler. Let cool slightly. 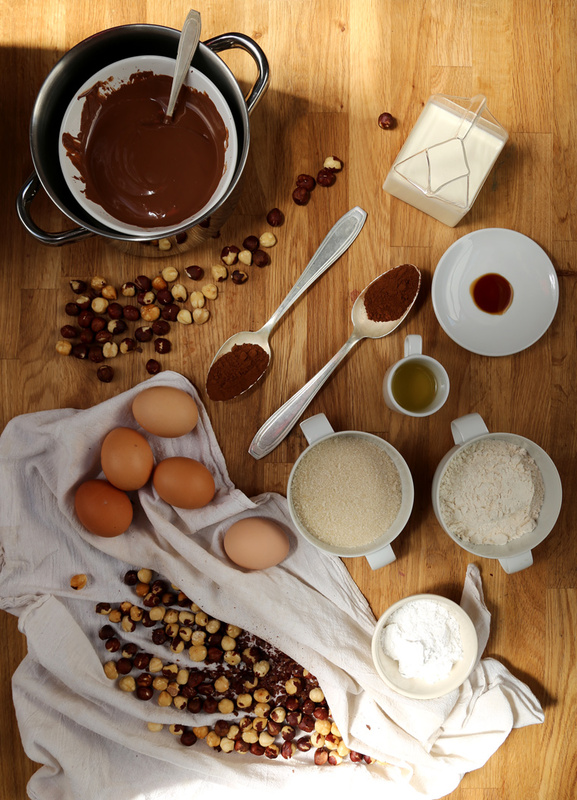 In your food processor: mix the nuts, salt, oil, powdered sugar, vanilla and cocoa powder together to form a paste. Then add the melted chocolate and blend until smooth. Done and delicious. 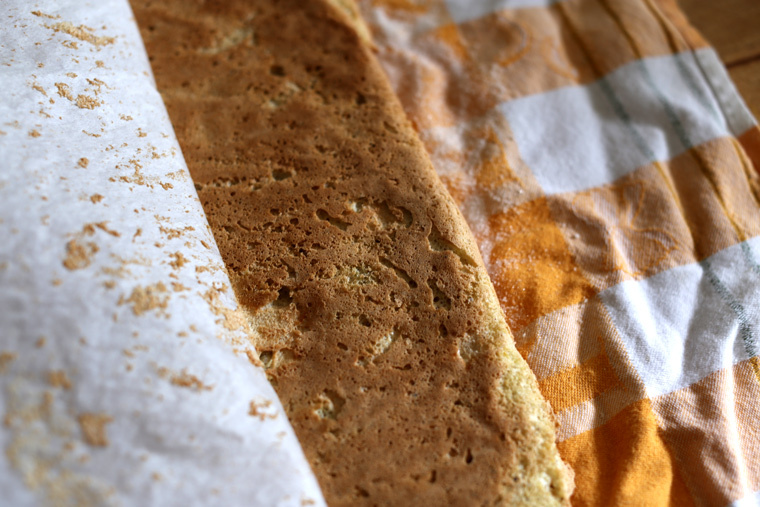 To make the pastry: line your baking sheet with the parchment paper. Preheat oven to 345F and place rack near top shelf. 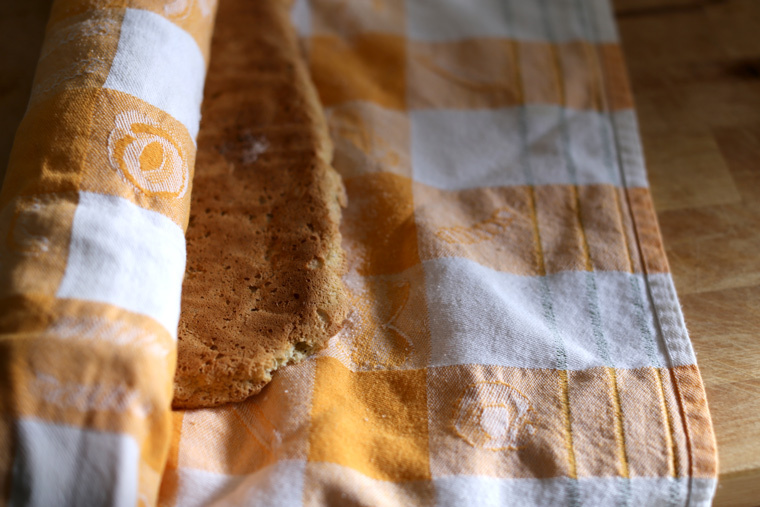 Lay out a clean dish towel and sprinkle with 1 tablespoon of sugar. Beat the egg whites to foam and then slowly add the sugar. This make a meringue. Continue beating until stable peaks form. Sift the flours on top. Break the egg yolk with a fork and drizzle over the snowy peaks. 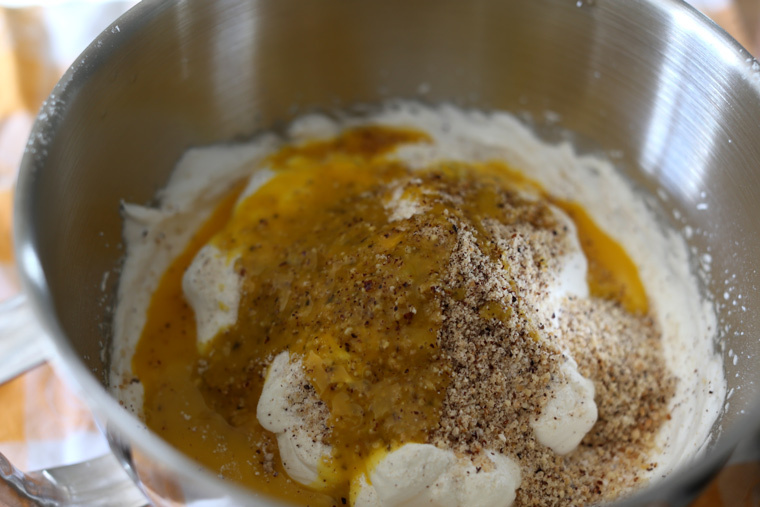 Gently fold the egg yolks and flour into the egg white meringue using a large wire whisk. It is ok if the mixture is not completely homogenous, it could even be slightly lumpy. It’s important is to keep it light. 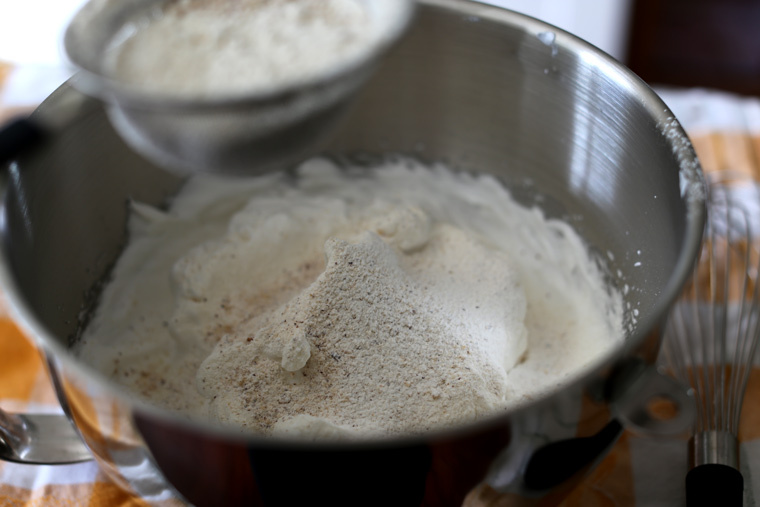 Whip whipping cream and when almost firm, add a heaping tablespoon of sugar. To make the hazelnut crocante, roughly chop nuts and place in pan on medium to low heat with a bit of butter. When toasty and fragrant turn off heat and add a tablespoon of sugar. When cool, unroll the pastry from the dish towel. 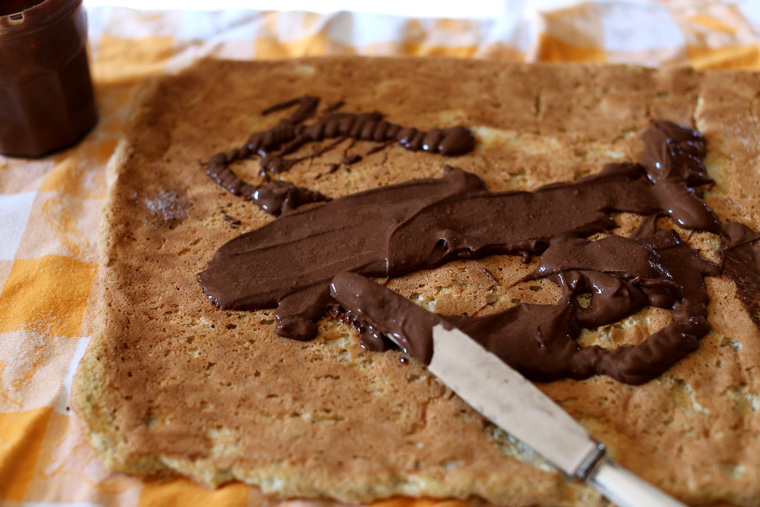 Spread nutella over pastry, sprinkle with hazelnut crocante and dust with cocoa powder. Spread cream over all that. Roll back up. 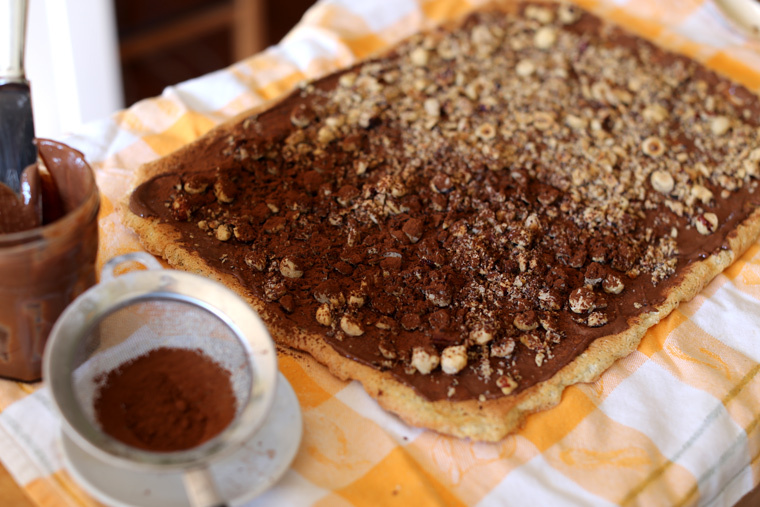 Dust with cocoa powder or spread on more nutella and hazelnuts as shown. By making your own Nutella you can avoid palm oil and help save the rainforest and the Orangutans. More about that here. Plus, it tastes just as good as the real thing. This looks so delicious! And Happy Birthday! Thank you so much Beth! I’m so happy I got to be part of this group giveaway. I just love your blog, everything you post is so super scrumptious! Happiest Birthday Grace. May all your dreams come true. Thank you for your sweet comment Judith. Oh lord, this looks so, so good!!!! 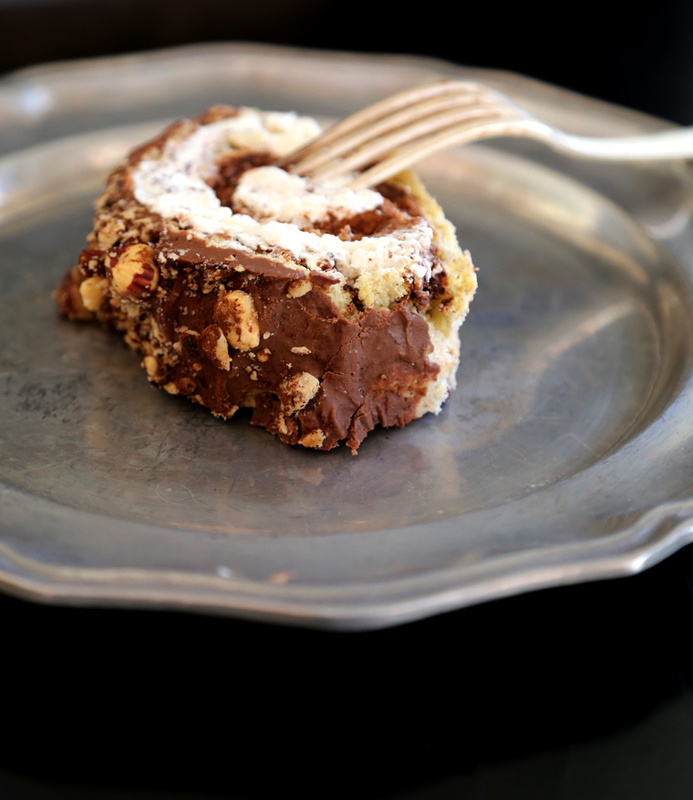 I love fluffy, mousse-filled cake rolls in any shape or size or flavor, but chocolate and hazelnut is a combo that can’t be beat. It looks delicious. Glad I found you, Grace! Happy birthday and happy Valentine’s Day! Cynthia! Thank you! Love your blog and your style so much! So happy I got to work with you on this amazing giveaway! Happiest of birthdays! 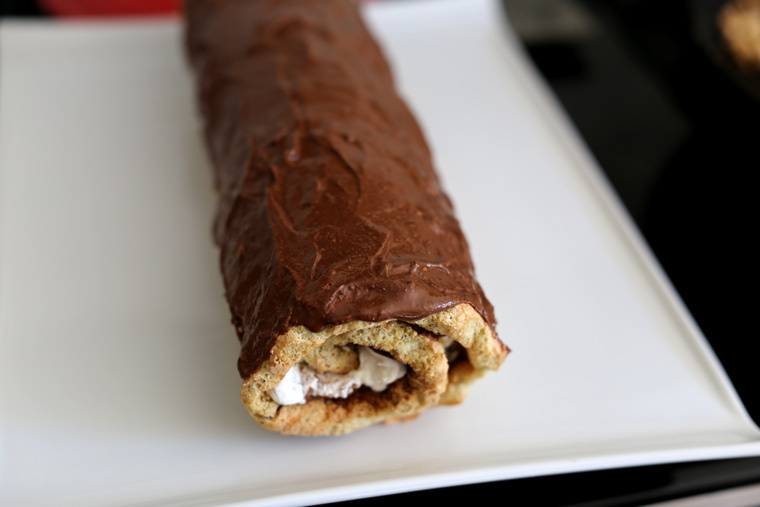 I hereby endorse gifting yourself with that entire roll of blissful hazelnutty goodness. Get after it, girl. As usual, gorgeous EVERYTHING. Glad we got to work together on this one! Hey Emily, thanks so much! And just for the record I ate one (gigantic) piece of this and shared the rest with my coworkers. I had a blast working with you, I wanna do it again! Happy Birthday, Grace! Hope your day was lovely! 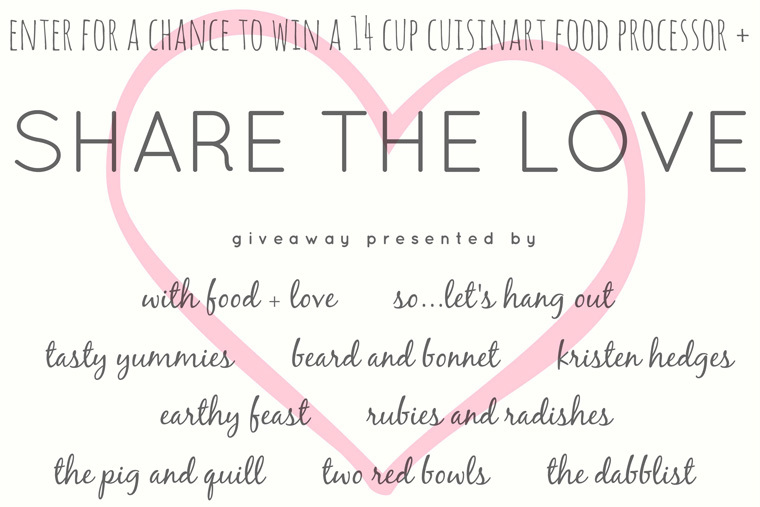 I just discovered your site via the share the love collaboration and I am LOVING your goreous photography! Oh Arsy! Thank you! This group giveaway has been a blast! So happy we got to work together! Sherrie! Thank you so much for having me in this amazing giveaway! It’s been a blast! Love your blog – love your style! xo!